Hello, you lovely tourists ! Welcome to Lyon ! You will find that our city has a lot to offer : beautiful architecture, really nice people and, most important of all, great cuisine. Maybe even the best in France. You can't come and visit Lyon without popping by an authentic "bouchon lyonnais". This is the absolute must-do. Unfortunately, it's not easy for foreigners to find them or even recognized them fromt the other restaurants. But worry not, Lyonresto will tell you all you need to know. First of all, you can spot a "bouchon" by his decoration : red and white tablecloth, wood, vintage furnitures, etc. When it comes to the food, just a glance at the menu should tell you whether or not you're in a "bouchon" : only typical dishes from Lyon. "What are those typical dishes ?" you may ask. Quenelles (pike), tête-de-veau (calf's head), cervelle de canuts (sort of cheese), pâté en croûte (cooked meat inside puff pastry), tarte aux pralines (praline pie), etc. To make things easier for you, we have established a list of the best authentic "bouchon lyonnais" that you just can't miss ! 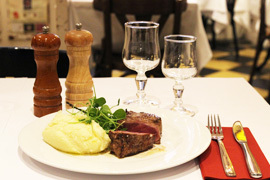 This authentic "bouchon lyonnais", found in the 3rd, 4th and 5th districts of Lyon, is one of the most popular. The tradition is truly honored here, especially in the kitchen where massive efforts are deployed to give every customer the best of Lyon's gastronomy. 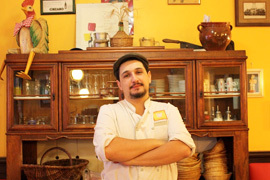 Joseph Viola, the chef, is one of the greatest names in our city : he's a M.O.F (best worker of France). Traditional cuisine is very important to him. 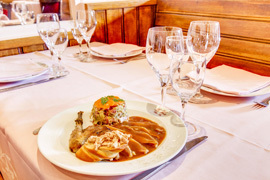 Quenelles, cervelles de canuts... And all those dishes are served with delicious and authentic french wine. An adress 100% approved by all lyonnais ! White and red tablecoth, wooden furniture, funny knick-knacks... We are, without a doubt, in a typical "bouchon". The chef, Yoann Blan, is a holder of a Michelin Star. Respect ! At La Tête de Lard he proposes all the most famous and delicious recipes of Lyon. But, in the summer, he also likes to cook some typical dishes from the South of France. Sometimes, he even mixes both, for our greater pleasure. The desserts are homemade and all the products are 100% fresh and seasonal. That's the french quality we're proud of. 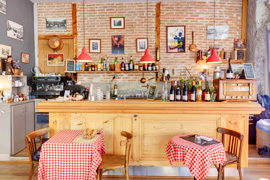 Located in the 2nd district of Lyon, Café Comptoir Abel is not exactly a "bouchon", but a bar / café. Nonetheless, this is the ideal place to get your feet wet into Lyon's culture. This bar is one of the most ancient of the town, and is absolutely fantastic. As soon as you enter, you can feel its history. Actually, this place is so out of the ordinary that a movie director used it as decor, years ago. 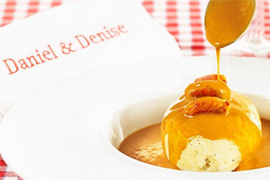 And if you have time, we highly encourage you to go to Le Bistrot d'Abel, as well. 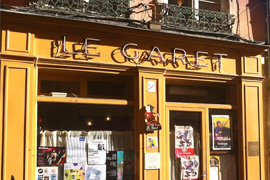 Le Garet is an institution in terms of great cuisine in Lyon. 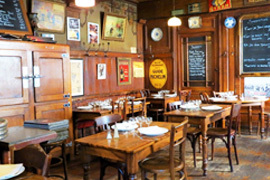 The atmosphere of the place is filled with warmth and conviviality- a any "bouchon" should be. He's a master : he has worked in a Bocuse Institute in the past. There, he did not only learn the culinary art, he also learned how to be a good host. He will make you feel like kings and queens ! Le Poêlon d'Or had only have talented and famous chefs in its kitchen in 100 years of existence. First, there was Marie Danièle, a renowned "Mère Lyonnaise". Today, Yann Lalle is the new chef and he lives up to the expectations ! He traveled around the world and worked with a lot of other chefs, holders of a Michelin star. The restaurant is simply gorgeous : big mirrors, ancient ceiling, vintage furnitures... Everything smells of authenticity, even the food ! And, yes, the quenelles are homemade, and that changes everything. You can trust us on this. If you still have room for a little sugary treat, then you should absolutely try the praline pie. 100% Lyon ! This "bouchon" is really the best for a first-timer. The decoration of the place recounts Lyon's history. Here, you get to sit next to complete strangers and pass around plates of food. This is exactly what a "bouchon" is meant to do : make you feel like home. The recipes have been passed on from generation to generation. 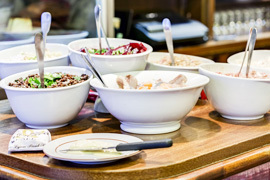 On the men : delicious typical dishes and homemade desserts. Yummy ! 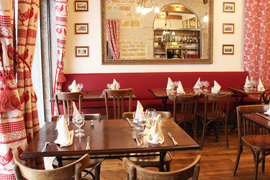 Located in the 5th district of Lyon, Chez Chabert is a real family business. Father and son, hand in hand, are doing their best to share their values : authenticity, tradition and togetherness. And it shows in the plate ! In this restaurant, all the specialities of Lyon are on the menu, even the desserts. Rice pudding, flan aux oeufs (custard), etc. As for the decoration, this place will make you feel a little bit nostalgic : yes, it has a strong 60's vibe. Chez Chabert just has everything we love ! Created in 1943 by Léa Bidaut, one of the most famous "Mère Lyonnaise", La Voûte (Chez Léa) is more than a restaurant. It's almost a monument. The place had not changed much in order to keep the authenticity. It has been 25 years, now, that Philippe Chamarande officiates in the kitchen and he does a great job at honoring Léa Bidaut's talent. Tablier de sapeur, tête-de-veau, poulet au vinaigre (chicken with vinegar)... Her good old recipes are still on the menu ! Two charming and adorable women are at the head of this typical "bouchon lyonnais". On the menu, you will only find classical dishes from Lyon, exclusively made with love and fresh products. The place is heartwarming and full of old and soulful objects. 100% authentic ! There's even a pretty patio for the good days. We just love it ! 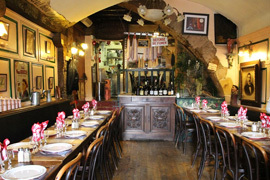 Located in the 5th district of Lyon, Aux Trois Maries is a restaurant which exists for 50 years. It's a proud part of the architectural heritage of Lyon. Aux Trois Maries is an ideal place to get the full experience of the life in Lyon.